How do I connect to a wireless network manually (Android) on the Samsung Multiroom app? Depending on the network environments, the product(s) may not be automatically connected. In that case, you can set up the product manually to connect to the network. 1. If the automatic setup fails, select the Manual. 2. 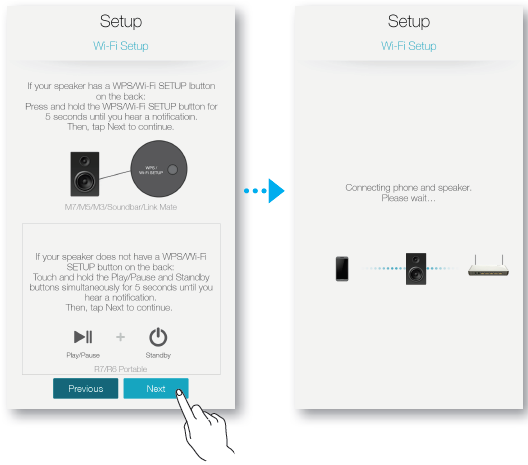 Press and hold both Play/Pause and Standby buttons simultaneously for more than 5 seconds to configure the Wi-Fi Setup. 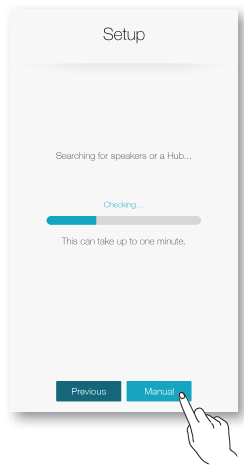 Note: The product can wait for 2 minutes in its standby mode until the Wi-Fi connection is established. 3. On your smart device, press Next. It searches for the device available for pairing. 4. Once an available device is found, the product tries to connect to the newly found smart device first, then it attempts to connect to the wireless network. In case of secure network, the password prompt appears on the smart device screen. Use the onscreen keyboard to enter the password. 5. Press the Connect. Network connection is completed.